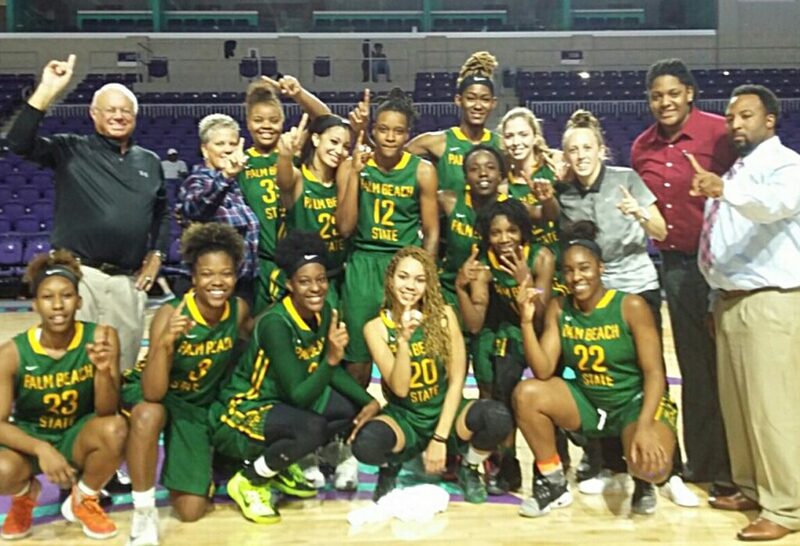 The women’s basketball team poses after their victory over Florida Southwestern State College. The Panthers put the game away in the third quarter leading by 34 points. Palm Beach was led by a trio of sophomores. Mississippi State signee Jonika Garvin (Lake Worth HS) led the way with 27 points and eight rebounds. Fellow classmates Shakoa Edwards (Boynton Beach HS) had 18 points and 11 assists and Alexis Jean (Treasure Coast HS) had 14 points and 14 rebounds on the night. With the win, the women improve to 21-2 overall, 10-0 in Southern Conference play and have a 15-game winning streak. The Panthers have not lost a game since Dec. 6, 2016. The latest NJCAA National Poll has Palm Beach State sitting at #12 in the country. The women are back on the court Wednesday, Feb. 22 at Eastern Florida State College and finish up the regular season at home on Saturday, Feb. 25 against Broward College. At the last game, they will honor their nine sophomores on Sophomore Appreciation Day. The Palm Beach State College team now advances to the NJCAA Region 8 State Championships March 8-11, 2017 in Ocala, Fla.